Take the Hanover St exit. Continue on North Hanover for approx 2.1 miles to Mervine St. Turn right onto Mervine St and “look for the gold domes”. The church is on the corner of Mervine and Juniper Sts. Take exit 32 (Quakertown, Pottstown). Take Rt 663 south for approx. 17 miles. Before you come to the Mervine St, look for the following landmarks: Brookside Family Restaurant, Dairy Queen and Burger King. When you come to the intersection of 663 and Mervine St, there will be a Sunoco gas station on the right corner. Turn right onto Mervine St and “look for the gold domes”. The church will be on the right-hand side on the corner of Mervine and Juniper Sts. For a complete list of upcoming services, please visit the Calendar on the parish website. 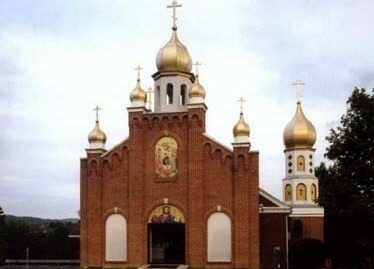 Holy Trinity Orthodox Church in Pottstown was established in the year 1928, a time of great turbulence and uncertainty in the historical development of the Orthodox Church in America. But the vision and determination of the small group of faithful in Pottstown was clear and certain. The people desired to have a House of Worship in their own immediate community. The distance to the nearest Orthodox parishes (Philadelphia, Reading, Chester) seriously hampered the full participation and practice of Orthodox life. Thus, on January 21, 1928, in the home of Thomas Seniuk (435 South St), concrete steps were initiated to establish a local parish. At the first meeting, temporary officers were elected, monthly dues were set at $2 per member, and all members were assessed $100 towards the building fund. In February, additional officers were elected, and in the same month the newly formed group held its first church dinner to raise funds for a church building. On March 25, 1928, the VRev George Popoff of Reading, PA served the first Divine Liturgy for the fledgling parish at the home of Alexander Poplawsky. Thereafter, Fr George cared for the new parish until a permanent pastor was secured. On April 28 the faithful decided to name their parish in honor of the Holy Trinity. On June 19 the first permanent pastor, Rev Nicholas Kovalchukoff, was assigned. Fr Nicholas celebrated the Divine Liturgy on Sundays and Feast Days at the home of Thomas Seniuk until December. On July 14, 1928, a contract was awarded to one Arthur Kepner to construct a church edifice. A few days later, on July 18, ground was broken for the new church. Within a relatively short time the building was completed at a cost of approximately $6000. December 16 was the memorable day when the first services were held in the newly constructed church. A few weeks later, on December 30, VRev Jonah Milasevich was assigned pastor of Holy Trinity Church. The determination and zeal of these founders was truly remarkable when one considers that within only one year, from January to December 1928, they organized a parish, erected a church building, had it consecrated, and secured a permanent pastor. What marvelous things are done when humans strive to fulfill the will of God on earth. In 1957, after 29 years of fruitful labor, Fr. Jonah Milasevich retired. Since that time, many dedicated priests, both permanent and temporary, have served at the Altar of Holy Trinity Church. The current pastor, Rev. Stephen Evanina, was assigned to Holy Trinity in August 2000, upon completion of his studies at St. TikhonÃÂ¶s Seminary. The parish has also sent one son to the Holy Priesthood, Rev. J Gregory Becker, who was ordained here on February 13, 1977, and now serves in the Romanian Episcopate. In addition, Holy Trinity Church has also been the recipient of the talents of many lay leaders and choir directors over the years. Of special distinction is Mr Stephen Kopestonsky of Philadelphia, who was a pioneer in the adaptation of traditional Slavonic liturgical music into the English language. The current choir director is Mr John Black Jr. In 1975 the first step in a new building program was taken: the construction of a new rectory on property adjoining the cemetery. The rectory was dedicated on a day of celebration, May 24, 1975. Plans for a new church had been drawn up. However, through the Grace of God, a building and suitable grounds located at the intersection of Mervine and Juniper Streets in Pottstown became available and were purchased by the congregation in 1979. The property is within walking distance of both the parish rectory and cemetery. The site also contained plentiful parking facilities and land, providing room for future growth and expansion. At the time of the purchase, the original church, rectory and property located at Lincoln and Hale Streets were sold. While the new building provided ample room for worship, it was not originally built as an Orthodox Church. As a result, it required extensive and detailed renovations, additions and redesign. Beginning in 1984, the people turned their attention to the task of slowly transforming and beautifying both the interior and exterior of the church in accordance with Orthodox tradition, work that is ongoing to the present. In the spring of 1986, a new hand-carved, solid wood iconostas designed, built and installed by Dn Oleg Machniuk was installed in the church. Just prior to the installation of the iconostas, the entire altar and ambo areas were reconstructed. On October 10, 1984, the parish commissioned iconographer Vladimir Krassovsky to provide the beautiful icons today seen adorning the iconostas He also produced the magnificent Resurrection Icon at the High Place, adorned with ornamental and filigree work (a project funded entirely by the Holy Trinity LadiesÃÂ¶ Altar Society). In September 1988 Dolan Construction Co, Inc were contracted by the parish to carry out a major redesign and reconstruction of both the exterior and interior of the church building. The church has been transformed into the shape of a cross with the addition of two side towers, which contain klirosi on opposite sides of the church. Furthermore, the entire face of the church building has been reconstructed with spaces for future mosaic icons. A bell tower has been added along with several cupolas crowned by magnificent crosses. Thus, the church is now visible and identifiable as an Orthodox structure and reaches out as a witness to our faith throughout the surrounding community. The parishioners rejoiced in the completion of the work with a 60th anniversary celebration on July 15, 1989 graced by the presence of Right Reverend Bishop Herman who con-celebrated with Rev. Fr. Andrew D. Nelko, rector of Holy Trinity. That morning the many children of the parish had led the procession of bishop and clergy from the rectory to the church to celebrate Divine Liturgy. In the years following, the parishioners struggled to maintain equilibrium in a time of change in the community and in the life of the Church. Parish presidents Nicholas Romanik and Kenneth Sekellick, each during his tenure, worked to keep the faithful together in a spirit of cooperation and unity of purpose for which the parish exists—eating at the Lord’s Table as a worshipping community. On a practical level, the parish was helped by The Very Rev. Nicholas Yuschak who said it was “a little angel” who did so many of the repairs to the rectory and the church, humble acts by this parish priest. Fr. Yuschak also initiated a project to refurbish the cupolas on the church exterior. In Lent 2000, the parish gained a new pastor, Rev. Stephen Evanina. Under his leadership and spiritual guidance, the parish membership increased steadily with twelve adults having been received into Orthodoxy through the Sacrament of Chrismation with one adult baptism. Shortly thereafter, Fr. Deacon Peter Skoog and his family joined the parish family in 2002. Deacon Peter serves at all liturgical services and works with the parish youth. With Fr. Stephen’s blessing, the parish embarked upon an ambitious church renovation and improvements project; notably, new carpeting throughout the church, new windows in the nave and sanctuary, air conditioning, and refurbishing of the restrooms. A structural stained glass door depicting the Archangel Michael was installed to replace the side entrance door. The stained-glass door was offered in memory of Mr. Michael Brilla by the Brilla and Marsteller families. Mrs. Christina Crawford served as council president during this time, the first woman to hold that office in the parish’s history. His Beatitude, Metropolitan THEODOSIUS celebrated Divine Liturgy with Fr. Stephen, Deacon Peter, and the parish faithful for their 75th Anniversary on October 23, 2003. Parishioners and friends gathered afterward at the Lakeside Inn, Limerick, for a Grand Banquet and dancing. Holy Trinity is especially well known in the community for its sales of ethnic foods made by a small band of dedicated workers who continue to increase revenue for the parish and to supply food for the parish’s annual bazaar. The Ladies Altar Society, under leadership of its current president, Mrs. Kristina Bendyk, continues to raise funds to beautify the church and to maintain its upkeep. With the increase of families attending Holy Trinity, the church school increased significantly during recent years. The church choir continues under the able leadership of its director, Reader John Black. As council president, Ms. Rebecca Hutnyan leads the parish with what she calls a “progressive” council..
With the transfer of Fr. Stephen Evanina to another parish in 2005, the church was without a full-time priest. The Very Rev. Michael Slovesko was assigned as interim pastor celebrating Divine Liturgy three Sundays each month while The Very Rev. Stephen Kopestonsky, also retired, celebrated Divine Liturgy for the parish faithful on the third Sunday of each month. The Rev. Deacon Peter Skoog served as church school coordinator in the absence of a full-time rector. His Grace, Bishop TIKHON, visited Holy Trinity in April 2006 and elevated Deacon Peter Skoog to Protodeacon and tonsured Mr. Jon Black as reader. The enthusiasm and spiritual guidance of Fr. Michael and Matushka Anna Marie have greatly invigorated the parish, and Holy Trinity’s faithful have felt gratitude and hope while awaiting the assignment of a permanent rector. In the Fall of 2006, Holy Trinity opened its doors to the Pottstown community and environs with a successful Open House. By October 2006, Fr. Michael was serving as interim pastor four Sundays of each month and assuming duties as church school director, and Ms. Jennifer Mourar began leading the parish Youth Council which comprised the various ages of the young people in the parish. Holy Trinity Orthodox Church has a building for worship, a parking lot, coffee hours, parish activities, and beautiful iconography. These things alone do not make a church, nor do they make a parish. People make the church, both clergy and laity. Its parish members are hard-working and committed to keeping Orthodox Christianity alive and well in the Pottstown area. Holy Trinity stands 78 years as a local church for Orthodox faithful who live in its environs, just as its original founders dreamed it to be.